18 Responses for "Not just a Sketch Challenge"
In the meantime, I’ll make one similar to the one below with Bella. I love that stamp! I like that you only stamped her! I am anxiously awaiting this stamp and my SnowBunnyBella! Can’t wait for them to arrive!! Love the colours you used on the second card! OK I need to clean my house and start laundry before I sit down to stamp! I totally understand the “restraint is a killer” LOL! but I am working on it too! These cards are great, stop using the Bellas you are going to make me WANT them too! LOLOLOL. I already started buying Lizzie Annes (great sets) but I can’t keep up! 🙂 Have fun at the baby shower and I will try and work on my version of these cool pop open card tonight! Thanks for the inspiration! I like both cards. I’m so excited to get my hands on some Bella stamps! Hope you had fun at the baby shower. Love your cards today! 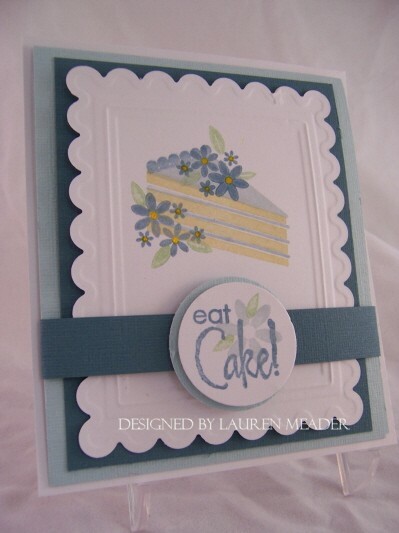 I love the way the belly band opens, and your cake looks so yummy and pretty! Bella is also looking real fine! 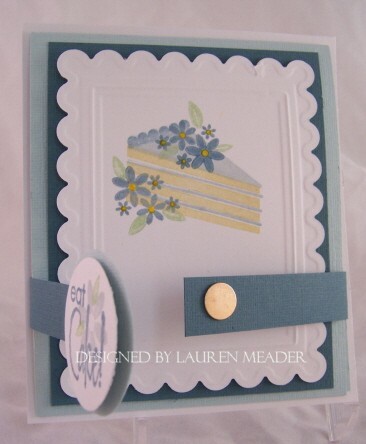 I love the fancy way you cut the designer paper, and that pretty flower! Great sketch Lauren! Awesome cards too, not that I’m surprised 😉 I like the idea of the magnetic closure on the band…smart! I too, am an independent shopping girl…I can SO carry my own bags, and not let Nick see the recipts! 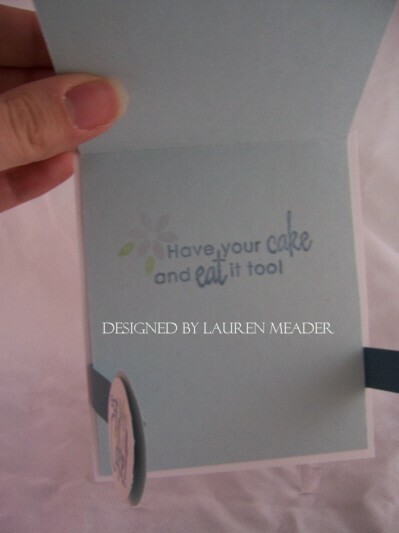 Lauren, you are so going to make me want that eat cake set; and I totally agree with you….who needs a fella to shop! I luv, luv, luv these card!!! I’m partisl to Bella’s myself, I luv her! You made me LOL when you mentioned hide the receipt. Hhehehe!!! That’s what I do & hide the bags in the trunk till hubby goes to bed then sneek then inside in downstairs closets. When he goes out next day, then I put everything away. But he always noticed when I had something new on…he’s just too observant. But yes I tell a little white lie when he asks how much! Hehehe! That’s not really a lie, right? Great cards! I love both, and “need” both stamps! 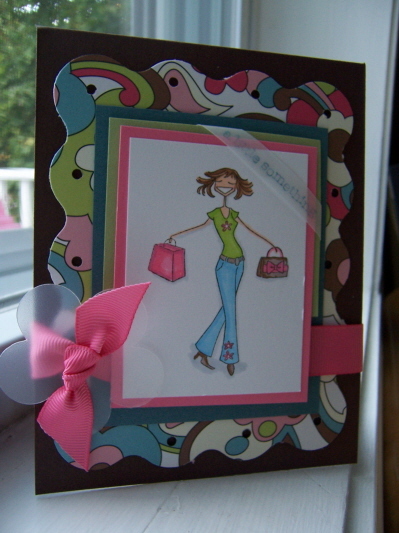 Here is my card, http://www.susanscornor.blogspot.com I just love all your cards with the eat cake stamps from papertreyink. Lauren, these are both awesome! I’ve seen those magnets but never purchased any! Good reason to now!! Fantastic cards Lauren! I love the magnetic snap, great touch. That bella is me this week…..shop, shop, shop. Sheesh. Oh and your plan to buy Christmas gifts early is awesome! I have been buying the girls presents since August, and I’m done with them! It’s so nice to check that off your list. Have fun at the baby shower! Here is my first attempt at this sketch. I went very simple but elegant, not sure why. LOLOL. I think I may give it a try with some other stamps later. Kinda unrelated, but your hair is so pretty. Have you seen naturallycurly.com? it’s a great web site for us curlygirls! What a cute idea! Here’s what I did with it.